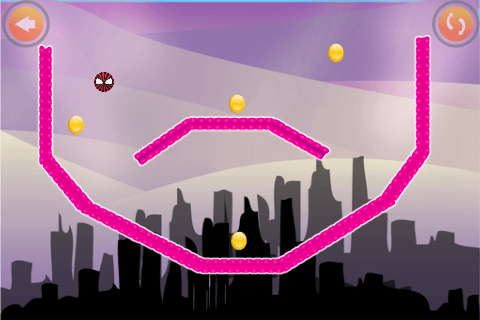 Spiderball is a platform puzzle game starring a bouncy ball that looks suspiciously like a certain superhero. This is one of those games that you are either going to love or hate, and you will either get to the evil fourth level, which I will come back to later, and persevere, or simply give up and delete the app. The difficulty level really is extremely high, which in a way is a refreshing change in these days of the level skip and unforgiving gamers. The whole vibe of the punishing challenge brings to mind old Amiga and Commodore 64 games, and that really isn’t a bad thing, for some people anyway. The controls are extremely simple. You hold left and the ball rolls left. Roll right and it rolls to the right. The trick is that the ball accelerates very quickly, from a standing start to light speed in a second or so, and this turn of speed is needed for the momentum based platform puzzles in the levels. Each level requires you to collect a certain amount of coins before the exit will appear. Falling out the level means instant game over, with all the coins back to where they started, and that’s too bad, as some of the coins look impossible to reach, perched high above you on platform. A combination of speed, momentum and blind luck earns you the coins, and then you have the arduous task of getting to the exit, which is usually the hardest spot to reach. This first happens on level 4. Not world four, I mean world one, level four. As you can see from the screenshot, you have to build up momentum like a skateboarder on a half pipe, collecting the coins by launching off at the right moment, and then do the same for the exit. Except getting to the exit is pure evil and may be the point where many will give up entirely. Your intrepid reviewer, however doesn’t have that choice, and had to finish the level, and I’m glad I did, as the feeling of immense satisfaction is something that no amount of achievements or online leader boards can give. There are forty levels over four worlds to bang your head against, and even unlockable characters to play as, so there is a fair amount of content here. The controls really do need fine tuning, particularly when trying to make small movements, as the ball does shoot off too quickly, and it can be frustrating to the point of being totally unreasonable on some of the later levels. But, that’s kind of the point. 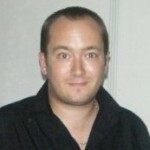 The developer has posted a challenge, and as I have already said, it is refreshing to find a game so emboldened by it’s own difficulty and unashamed and unafraid to punish the player. So, it really comes down to the player. If you grew up in the days of Mega Man and BattleToads or just relish a challenge whose only reward is another testing level, then Spiderball comes highly recommended. If, on the other hand you don’t like the idea of repeating levels fifty times or more, and I’m guessing that’s 90% of modern smartphone owners, then this really isn’t for you on any level. Overall, I really enjoyed my time with Spiderball, even if my device nearly ended up thrown against the wall more than once. If the developer could add an easy mode, with a few level pass tokens and maybe a hint system, and with a little tinkering to the controls, they could have something special here. As it stands, if my description of level four is your idea of heaven or hell, then you can make you own recommendation based on that, and I have to plant the score right in the middle of those polar opposites. Go on, give it a try. I dare you.